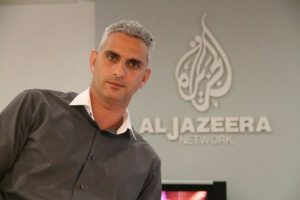 The Israeli government Wednesday chose to monitor Elias Karram’s work for six months instead of revoking al Jazeera journalist’s credentials after the Jewish authorities accused him of endorsing the Palestinian resistance in his reporting. “In light of his unequivocal remarks, the government press office has decided not to immediately revoke Karram’s (press) card, and in the next six months to monitor his reports in Al-Jazeera in order to ensure that his clear statements are reflected in his actual journalistic work and were not mere words,” the Israeli government press office said. Karram and his employer have been in the eyes of the storm in Israel since last month. The government, led by ultra nationalist leader Benjamin Netanyahu, last month threatened to revoke the credentials of journalists at al Jazeera Jerusalem office over accusation that the media incites violence. Karram’s credential was put on the line August 16 pending a hearing, which took place five days later, AFP reports. The Arab-Israeli journalist has been blamed for being bias after a video of an interview recorded last year was released by the government press office. Karram in the interview called his work an “integral part” of Palestinian resistance to Israel’s occupation. The journalist during the hearing reportedly denied supporting the Palestinian resistance, the armed resistance in particular. The resistance means only media exposure to the reality of the Palestinian people living under occupation, Karram reportedly said.